I'd like to share with you what would be considered in the car world to be a "barn find" — something of great value you didn't know was there, assumed to be gone forever. This is the story of my grandfather's B-17 crew, based on a journal and photos found in his attic after his passing away. On June 25th 1944, ten brave young men began training together at Ardmore, Oklahoma. Two months later, they picked up a Boeing B-17-G in Lincoln, Nebraska, with orders to deliver it to Burtonwood Air Depot at Cheshire, England. The pilots, Bill Whitehead (back row, 1st on the left) and Sully Sullivan (back row, 2nd from left) had a combined total of 250 hours in the cockpit. My grandfather, Gene "Hack" Hackney (back row, 3rd from left) was the Navigator. From Lincoln, they refueled in Grenier Field, New Hampshire, Goose Bay in Labrador, and Reykjavik. Hack's crew was part of the Eighth Air Force, 385th Bomber Group and stationed at a base called Great Ashfield, at Elmswell, England. Great Ashfield was about two square miles, and housed about two thousand men on base. Half of these men were on flight status. There were six separated housing units. Ground crews lived in tents. Hack's crew named their plane, A Boeing B-17-G, serial number 338544, "Blind Date." She had a cruising speed at 25,000 feet of 200 miles per hour, with an indicated speed of 155MPH. It could climb 900 feet per minute with a 4,000 pound bomb load, and had a maximum weight of 63,500 pounds. Also on board were 13 machine guns, with 5,700 rounds of ammunition. In flying formation, three or more planes made a flight. Three or more flights made a squadron. Three or more squadrons made a group. Each group had its own airdrome (base). On board, the pilots "Pop" Whitehead and "Sully" Sullivan alternated turns at the controls every 15 minutes. Pop and Sully were both "first pilots" — the airline equivalent of flying with two captains instead of the usual captain and first officer. They had become friends during training, trusted each other, and decided to stick together on the same crew. "The most nerve racking part of a mission was during the first hour after take-off. That was when we had to keep a close watch to avoid other aircraft. There was very little chatter on the intercom. After we settled into formation we sat back and relaxed a little." Planes normally took off thirty seconds apart, unless there was bad weather then it was stretched to 1 minute. Pilots were assigned formation positions during during their briefings before each mission. 10-26-44 Hanover: Flew as co-pilot with experienced crew for first mission. Easy target. Mission uneventful. 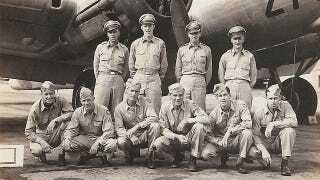 10-30-44 Mersburg: First mission for us as a crew. Felt much better with men I knew. Weather bad. Mission scrubbed after we had flown over enemy line. Dumped bombs. 11-2-44 Mersburg: Leader of our element dropped his [landing] gear and left formation smoking. We suffered heavy damage on bomb run and left formation too. Jack [Jack Povey, Radio & Gunner] wounded in arm. We flew home on three engines a couple of hundred feet off the ground. Plane full of holes. 11-5-44 Ludwigshaven: Flak heavy over target. Mellinger led our squadron through without damage. Rest of group lost three planes. 11-7-44 Duichburg: Milk run. Jack's back with us. 11-16-44 Aachen: Milk run. Asked for competent ground crew. 11-25-44 Mersburg: Heavy flak again. One squadron landed in Brussels because of bad weather at home. We made it back to base with no damage. 11-26-44 Hamm: Two planes failed to return. Weather lousy. Glad Sully and I practiced so many instrument take-offs. 11-27-44 Bingen: Weather broke up our formation over channel. We returned to base and landed with bombs. Got credit for mission anyway. 11-30-44 Mersburg: Flak very heavy. Saw three B17s go down. P51s all over the place. No damage. Good leadership. 12-4-44 Mainz: Weather very cold. Milk run. 12-10-44 Koblenz: Cautioned not to leave crap in flak helmets. Milk run. Getting used to fog. 12-12-44 Darmstodt: Lost turbo after take off. Couldn't join formation. Flew to target and back by ourselves. 12-24-44 Gross Ostheim: Voght [pilot in another plane] killed in mid-air collision on assembly. Camera showed we missed target completely. 50 degrees below freezing at altitude. 12-31-44 Hamburg: Bombed jet factory. Saw first enemy jet fighters. Could see factory burning on way out. 1-3-45 Schlidner: Milk run. Can't understand why we have to fly in this weather. Couldn't even see to taxi. 1-5-45 Kaiseslautern: Landed in France. Lost gas. Not enough sand on the runway. Nearly overshot. 1-10-45 Karlsruhe: Very cold. Two planes cracked up on take off. Had to feather [engine] #3 on assembly over England. Crew wanted credit for another mission so we flew in alone again. Lots of P51 protection. Lost turbo on another engine at I.P. Dropped to lower altitude so it would function. Dumped bombs in channel. 1-16-45 Dessau: Long trip. Poor leadership. Got unnecessary flak. Asked Major Reid at critique why we kept flying in a straight line in a flak field. 1-18-45 Kaiseslautern: Poor leadership again. Made too many runs on target. Macerlain ditched in channel out of gas. We left formation and landed in France. Too low on gas. Our planes were scattered all over England. 2-3-45 Berlin: Flak very light. Dropped 500-pounders. 2-9-45 Dulmen: First radar bombing. Didn't see ground from start to finish. 2-14-45 Chemnitz: Long trip to help Russians. No flak. Saw P51 shot down. 2-15-45 Wenzendorf: Milk run. Beginning to see the end. 2-17-45 Frankfurt: Started long haul to Dresdon but weather turned us back. Bombed Frankfurt instead on the way home. Heavy Flak. Saw B17 ahead do complete slow roll. 2-19-45 Rheine: Milk run. Just a few missions left. 3-4-45 Nurnburg: Hit bad weather and returned with bombs. 3-5-45 Chemnitz: Bad weather again. Our group got scattered all over. We joined first division outfit. 3-8-45 Dortmund: Good leadership. Uneventful. 3-11-45 Hamburg: Milk run. Crew cheerful and nonchalant. 3-12-45 Swinemund: Longest trip yet. Bombed German Navy. 3-13-45 Hanover: Heavy flak. Every plane returned damaged. 3-18-45 Berlin: Drew jack pot for last one. Flak very thick over target. Windshield smashed and aileron damaged. Banked plane by using engines. Flew all the way home at roof top level to avoid flak. Pilot Voght mentioned in Mission 15 was a close friend of Hack's. Seeing his buddy die on Christmas Eve put Hack into a brief state of depression at Christmas time for the rest of his life. He never spoke about it, but it was something we all knew. The "Blind Date" crew did see a little break in the action after Mission 25, when they were sent to a first class resort for some R&R in Southport, England, about 30 miles west of Manchester. Mission 35, to Berlin, began by being awakened at 4:00AM, followed by breakfast at 4:30, and mission briefing at 5:30. At 6:30 they dressed in their flight equipment and were taken out to their plane by truck, where everyone took their assigned positions and the pilots completed pre-flight inspections and checklists. At 7:45AM, the deep hum of 1200-horsepower Wright Cyclone engines filled the air. Take off was at 8:10AM and the bombers assembled into formation at 6,500 feet. They reached their initial target point almost four hours later at 11:50AM. Bombing began at 12:01PM and six minutes later, it was all over. They returned to base at 4:16PM and went to a post-mission briefing, where they were given coffee and rum by the Red Cross, along with being interviewed by intelligence. "The long hard days with the responsibilities of our positions also made us somewhat indifferent to [the other flight crews]. After 35 missions we wanted to get out of this world of organized insanity. We wanted to get back home. There was no celebration of any kind. We indifferently went our separate ways. It just wasn't possible to thanks or to shake hands or to say goodbye to the men that you owed so much." The Blind Date crew, photographed after their final mission. The 385th Bomber Group flew 296 missions from July 1943 to the end of the war in 1945, dropping 18,494 tons of bombs on Europe. Over 1,950 men completed combat tours, while more than 1,400 others were lost in combat and crashes. 129 B-17s from the group were lost in combat, but averaged only one aircraft loss for every 64 combat sorties flown. The notes kept in the journal were made by the pilot Bill "Pop" Whitehead, and given to my grandfather as copies in a bound book. The photos featured here were found and scanned by myself. I can't verify who the photographer was, but they were taken by various crew members. According to Pop's obituary, there are still two surviving crew members. Hack passed away in 2005, at age 80. I'm proud to have his original bomber jacket, hat and dog tags in my possession.